Recipe for piri piri prawns (on the barbecue), Tribes restaurant Dubai, South Africa heritage day, and my first taste of tripe! If I say ‘Chinese food’, what do you think of? Spring rolls, sweet and sour, chow mein, chop suey, dim sum… How about American food? Hamburgers, hot-dogs, clam chowder, apple pie…. Now African food? Drawing a blank? Me too. All three are vast continents with a diverse range of cuisines but somehow Africa remains elusive and hard to define. The distances, the multiple tribes, the different languages (11 official in South Africa alone) a chequered history of colonisation and migrants, huge ranges in climate and fortunes. Perhaps it’s the misconceptions and assumptions about recording African history (interesting article here). My travels have taken me to three African countries and three completely different experiences of food. Libyan cuisine was a wonderful mix of North African and Arabic with Italian influences – some of the most delicious meals I have ever eaten. The Egyptian diaspora has helped to forge what we think of as Middle Eastern cuisine in particular falafel, foul, and kosheri. My visit to South Africa was in 1997 and we ate fantastic fresh food served impeccably in great locations but most was Western-style. The exception was an ‘African’ restaurant in Cape Town which presented a series of plates throughout the evening resembling a game safari commentary. Zebra was followed by warthog, antelope and then springbok. We thought it was a bit bizarre to be eating their national emblem! I didn’t leave with a sense of local dishes though. Our trip was barely a year after South African Heritage Day was created by President Mandela as head of the first democratically-elected government on 24th September 1996. In fact the great man himself passed by just a few feet away from us while we were strolling round the Victoria and Alfred waterfront; we only caught a glimpse as he was surrounded by a throng of people desperate to see ‘madiba’. So how strange more than a decade later, to be sitting in a restaurant situated inside a shopping mall in Dubai, being spoken to in Zulu and offered the favourite home cooking dishes from a tribe. I am in Tribes, a casual dining restaurant in the Fashion Dome of Mall of the Emirates. The menu is described as a fusion of exotic flavours taken from the African continent since the Tribal era, influenced by the Spice Islands of the East, the French in the West, the Malay & Dutch in the South and the Arabic flavours of the North. The waiting staff all originate from African tribes including Xosa, Nguni, Tawareq, Shona, Luhyia and Kikuyu. The interior is unexpectedly cavernous, some areas a bit sterile due to harsh lighting but others really cosy (the nook behind the open kitchen with a stunning fire-pit). The ‘hakuna mattata’ plate has a range of interesting things, some familiar like peri peri prawns, others less so like chicken giblets. But we are here to taste a special traditional menu including tripe stew with beans and tomato served with ‘pap’ and pan-fried calf’s liver served with yam mash. Manager Sipho assured us that this was exactly what his mother made for special gatherings and encouraged us to eat with our hands (we didn’t!). I took my first ever bite of tripe, the texture was soft, not chewy like I’d expected and the sauce tasty. The calves liver was made African-style, I’m more used to thinly-sliced and lightly cooked, this was strongly flavoured. The pap is made from finely ground maize and is a sort of porridge eaten daily by many people in Africa. The yam mash was very creamy (similar in texture to Turkish mashed potatoes), both were a good foil for the intense tastes of the meat. Tribes have put these items on the menu from 21-27th September and hope to encourage as many people from Africa who live or are visiting Dubai to come and celebrate Heritage day with them, as well as other nationalities. On the day itself, the 24th, you can have your face painted with traditional designs and your photograph taken with authentic African shields and armour. Look out for the traditional drumming and singing too – it’ll put a smile on your face (this is more a family restaurant than a romantic meal for two venue). You don’t have to eat tripe or liver, by the way, lots of more approachable dishes were coming out of the kitchen while I was there and the puddings we had were excellent. Read more about Tribes by Ishita Debbie (GA) and Debbie. 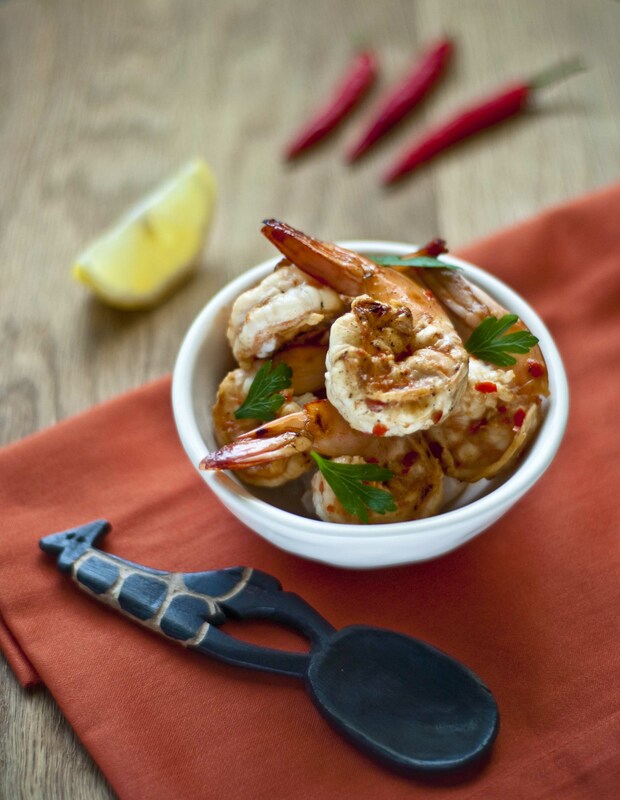 Anyway, back to those peri-peri prawns – a recipe from Mozambique. I expected tasty (they were) and very hot and spicy (they weren’t). So I rustled up a batch of piri piri sauce at home and lit up the barbecue. Smeared over chicken Portuguese-stye was good and the sweet prawns were really fiery (which is good in our house!). The weather is cooling down here in Dubai and barbecue season will start soon and carry on for month, after glorious month. My South African neighbours seem to be permanently in the garden as they fire up a ‘braai’ and it’s the third year that I’m cooking something for Jeanne at Cook Sister’s Braai, the beloved country event. Alliterative by accident – pears last year, pineapple the year before and now prawns. I’ve booked my flight (with Airmiles ME) and I’m off to Food Blogger Connect at the end of this week. Guess who I’m staying with on Thursday? Jeanne from Cook Sister; who, despite never having met me before, has invited me to her home for a braai. I feel I know Jeanne already through her blog, on Twitter and as she is a dear friend of Meeta from What’s For Lunch Honey? who is returning back to Dubai in October to host another Food Photography and Styling Workshop, this time at the beautiful Miele Gallery plus we’ve got a fabulous field trip to Atlantis, The Palm. And back to those prawns…. Put all the ingredients in a blender and blitz until smooth. Store in a jar in the fridge until ready to use. 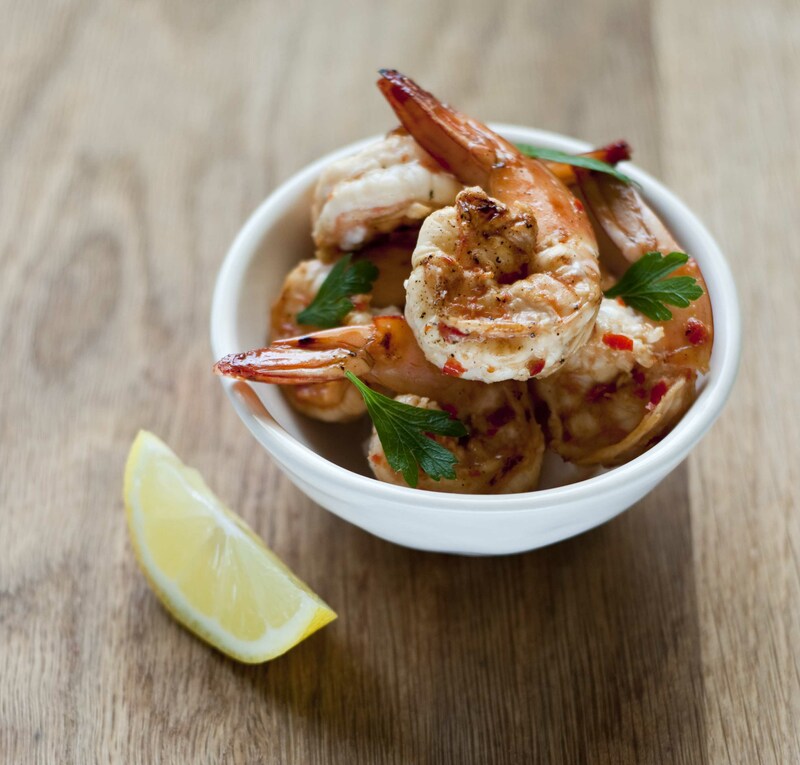 Put raw, cleaned, tail-on tiger prawns into a bowl and pour over enough sauce to coat. Leave for 2-3 minutes only. 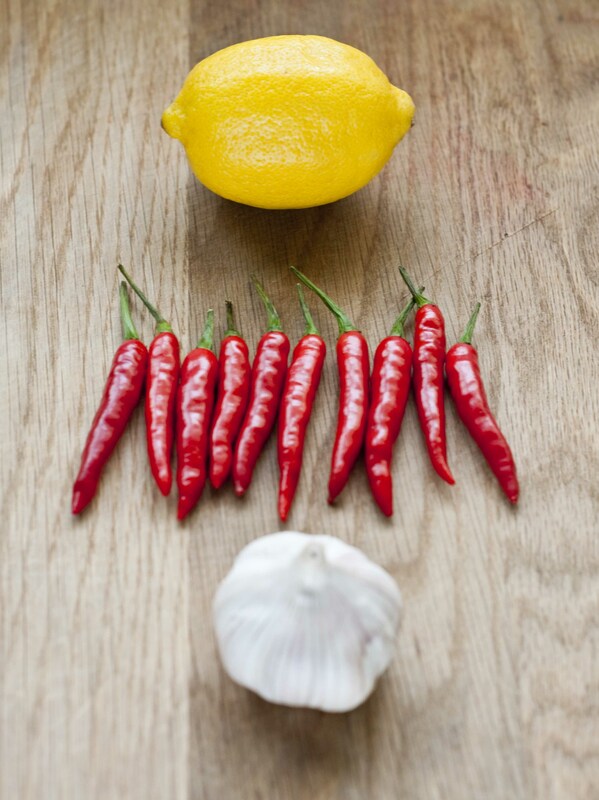 Thread onto pre-soaked wooden skewers or put straight on the bars of the barbecue (high direct heat). Grill for about 2 minutes and turn over for about 1 more minute. When the prawns are opaque they are done. Serve immediately with a little more dipping sauce if you like mega-spicy! For chicken, marinate the pieces for at least 30 minutes (or longer) before barbecuing. Good with a yoghurt, lime and coriander dip. Wondering about the link with Africa, Portugal, America and peri peri? An interesting Wikipedia piece here. Disclosure: I was a guest of Tribes, Mall of the Emirates, Dubai, UAE. Love the chiles spelling out “Africa.” Nice recipe as well. 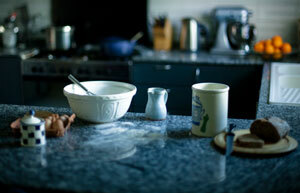 I wish I could whip across the world and be at the food photography class. Nice pics! If you could buy any camera (there is a big sale at a camera store that is closing near me) what would you buy? I’m still on a big learning curve as far as photography is concerned. I have learned that it’s usually the lens that makes the most difference and lenses are least talked about. Nikon and Canon are the two most popular choices in DSLR (I presume that you are not thinking of a point and shoot). I have the Nikon D5000 which is compact and also has a High definition video camera. The lens I use most for food photography is a 50mm 1.8 but because there is no motor in the body of the camera I have to use the little light in the view-finder to get it into focus. I think the D90 would ensure full auto-focus. The kit lens that came with the camera 18-55 is a good all purpose although I am saving up for 55-200mm. For landscapes I’ve got a 35mm wide angle (fixed or prime lens) which I’ve had a lot of fun with (relatively uncostly too). Hope that’s helpful. I email, tweeted, chatted and read a load of food blogs before I took the plunge…it’s expensive equipment and you don’t always get it right! It was great fun being at this event with you. Loved how it reminded you of your Kilimanjaro trip. Still need to pick your brains about how your pics look that good! I’m finally shooting in RAW and have dipped my toe into Photoshop – shock horror. 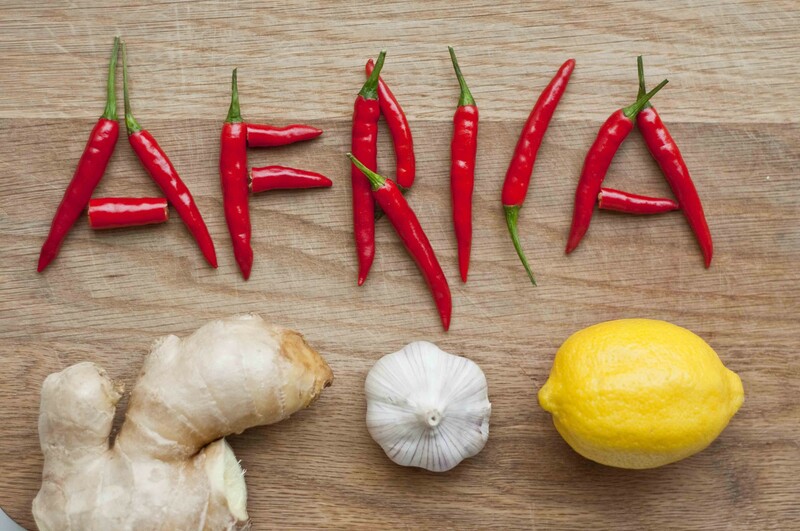 Fantastic Sally, the way you have written Africa with the chillies and absolutely longing for the Piri Piri Prawns… and the article really begins with the absolute truth – generally we have such blurry notions about food from the vast continent. Have a great time in the Blogger Connect. 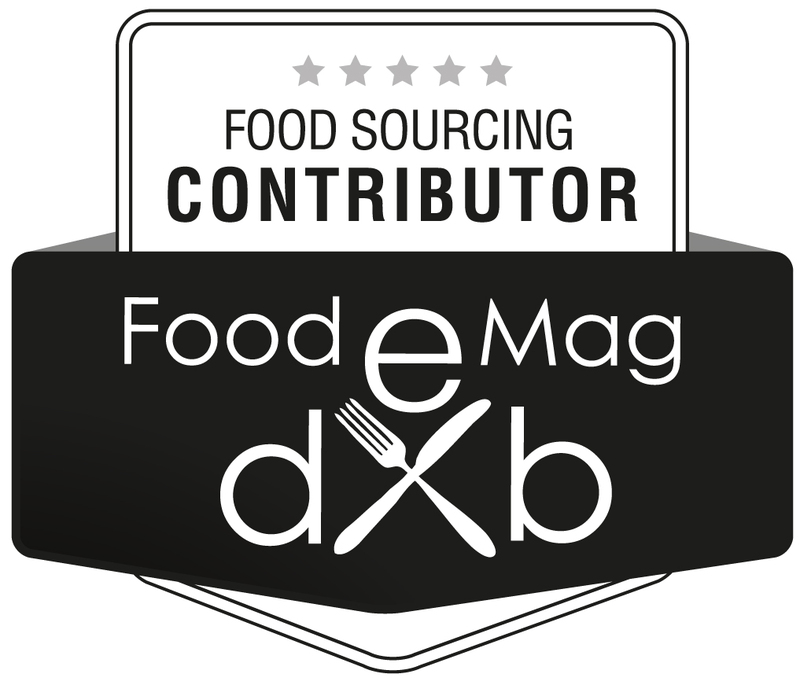 Many good wishes from all the foodies in UAE, waiting to hear all that happens there. And many thinks for tagging me in – really sweet of you! As always you were terrific company. Thanks for giving me the credit for cutting everyone’s food up for them! Am blushing! You role was quite pivotal! I’ve got a feeling we will have a ball! I love peri peri anything. Prawns sound mouthwatering. As for tripe not a great fan of it. Great read.. Thanks Felicia – I can’t ever imagine loving tripe….but it was good to try it. They cook it for hours and hours with lots of herbs and spices. 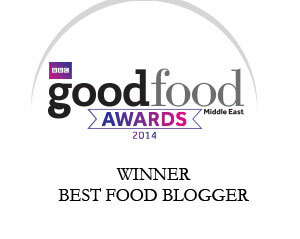 Thanks so much for linking to my blog! Lovely post. You are welcome – there is always a wealth of interesting information there – I was good timing that I was just writing about Africa when I read that post. This dish looks amazing and so tasty! Ethiopian food – now that sounds interesting…off to look at your blog and Google. 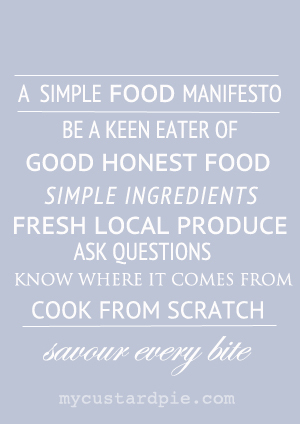 Inspiring, tantalising and evocative – you always deliver delicousness Sally! Thank you! Enjoy blogger connect – you will be a gift to the attendees. What a touching and generous comment Tara. Many, many thanks. Delicious looking, and I can only imagine how heavenly it all smelled! I too know next to nothing about the cooking of the many African countries, but realise that it would be something you could never generalise about – far too diverse in culture, geography and politics (re food and ag policies). My husband, although British, was born and lived hie early years in Lusaka, Zambia. His mother, a fabulous cook, has given me a few recipes from her time there and sometimes I make them, always wondering why I don’t do it more often. I love how they make vegetables the centre, with meat usually having a garnishing and flavouring role. Piri Piri prawns was a huge favourite of my husband’s and this looks a great recipe to surprise him with. Hope to see you at FBC 2012. First-timer nerves here though. Btw, I only tried tripe recently, in Italy. I wouldn’t say it is my favourite thing in the world but it was much nicer than I had anticipated. Very soft and not at all chewy. Just discovered your blog after following a comment you posted on mine 🙂 Thank you! I’m thrilled to discover My Custard Pie. Your recipes look amazing and your photos are gorgeous! Gorgeous! These shrimp looks really fantastic…love the flavors going on, YUM! I LOVE the “Africa” photo! Imagine finding traditional African fare in Dubai! How wonderful. Dave lived in Zimbabwe for 2 years, and so I’ve heard a lot about the food of Zim and South Africa. 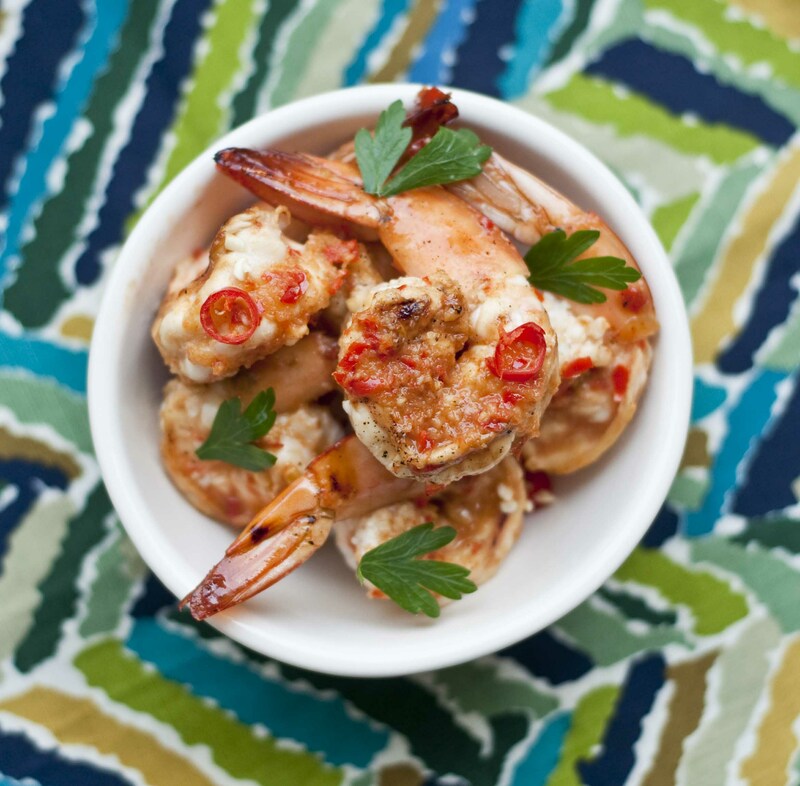 The shrimp recipe looks delicious and and the photos are, in fact, making me hungry right now! Aaah – nice to read about your evening at Tribes – I remember we were chatting about it the day before you went! I am guessing Sipho was South African – it’s a really common Zulu/Xhosa name 🙂 The food sounds pretty authentic too – trips and “mealiepap” is very popular in S Africa (as are piri piri prawns!). Thanks so much for taking part (three years!! Time does fly…) and can’t wait to meet you on Thursday! If it’s cold, hubby has agreed to braai while we watch from the conservatory LOL! Mealiepap was what he called it – you would have felt right at home! Love the chiles spelling out “Africa.” It was a great shot & very original too! I love the dish! Very me! And I also love the giraffe spoon! 🙂 MMMMM! A dear friend brought the spoon from Zambia – who knew it would come in handy in such a setting? Sally, so wonderful to be transported through your post! I went to Africa in August (Dar es Salaam and Zanzibar) and had such an amazing time! The food was amazing and reminded me so much of our colourful and spicy Jamaican food. It was just amazing! Your photos are really awesome! Way to go! Thank you so much. I like spicy of all description! Fantastic! I have a huge jar of molasses waiting in my pantry. Spring has sprung here, and this looks like the perfect light, out-doorsy dinner. Love your giraffe spoon! What a gorgeous pic. Thanks for stopping by and liking my blog.